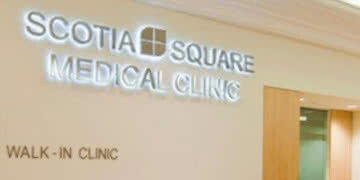 We are a multi-speciality clinic conveniently located in the Scotia Square Shopping Centre in the heart of downtown Halifax. We provide most medical services with NO APPOINTMENTS NECESSARY. Our walk-in clinic is a physician-run facility, fully committed to quality patient care. Our doctors are experienced, qualified, and certified. The patient-doctor relationship is of utmost importance to us. We support a longitudinal type of care that looks after the patient’s needs and doesn’t stop at the walk in visit.